Within the boxed layout, Hannah offers excellent customization possibilities. Each vertical line of module positions includes an option to manually set the ratio of widths of each module within that line. Using the 'Module Style Overrides' feature you can then apply custom styling to each module position using a host of different options including margin/padding, text color, button color, background color and even set your own unique background image. The option to apply your own color to the general styling is a essential option when starting out on any project and Hannah ensures not to leave you wanting. Hannah's template parameters includes color pickers for almost every element of the design giving you total control of the look and feel of your site. Background images can be set for numerous areas of your template within the same template settings. We have included a number of module extensions to allow you to quickly and easily implement common website elements within each position. Galleries, icons cards, pricing table and profile cards become a reality with a few simple clicks using these extensions. All this is within a fully responsive layout giving your the best possible viewing across all devices. 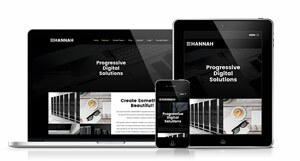 Hannah will automatically adjust your site content to best suit the device that it is been displayed on. A number of responsive options are available including a choice in mobile menu and an option to set your own custom CSS depending on the device. Stand out from the crowd today with the modern and bold Hannah Joomla template!